There is only one question you'll be asking yourself when you arrive: Will I ever be able to leave? The magnificent architect-designed Villa Fleur de Canne is located at Pointe Noire in Guadeloupe, on the Côte-sous-le-vent. This luxurious 2,690 sq. ft. villa is spacious and can accommodate up to 12 people. On three floors, it is perfectly designed to welcome large families or groups of friends. You can play pool while others swim in the pool or lounge on beach chairs while admiring the sea. On the main floor, a spacious open-plan living room overlooks the pool and the sea and is the perfect spot for cocktails. This living space, combining living room, bar, and game room, is designed for relaxation. You can play table soccer, board games or read a book while sipping a cocktail. On the garden level, a second living room, with a TV and comfortable leather sofas, has a pool table. A spacious kitchen opens onto the terrace where you'll find a big wooden table around which you'll enjoy your meals. The kitchen is fully-fitted: a five burner cooktop, KitchenAid food processor, ice-cream maker, wine refrigerator, etc. You can have a relaxing nap around the pool after mealtime. Let yourself be carried away by the sound of the waves. There is plenty of gear for the children: pool noodles, masks and snorkels, and a tennis table. At the back of the garden, a little gate leads directly to the sea. The five bedrooms are spread over the two upper floors: two bedrooms with two twin beds, and three bedrooms with double beds. Each bedroom has air conditioning and a balcony, while two of the bedrooms have a sea view. This villa is a veritable oasis of calm, where the only intrusion comes from the iguanas discretely walking across the garden. Aline will warmly welcome you and pamper you during your stay. 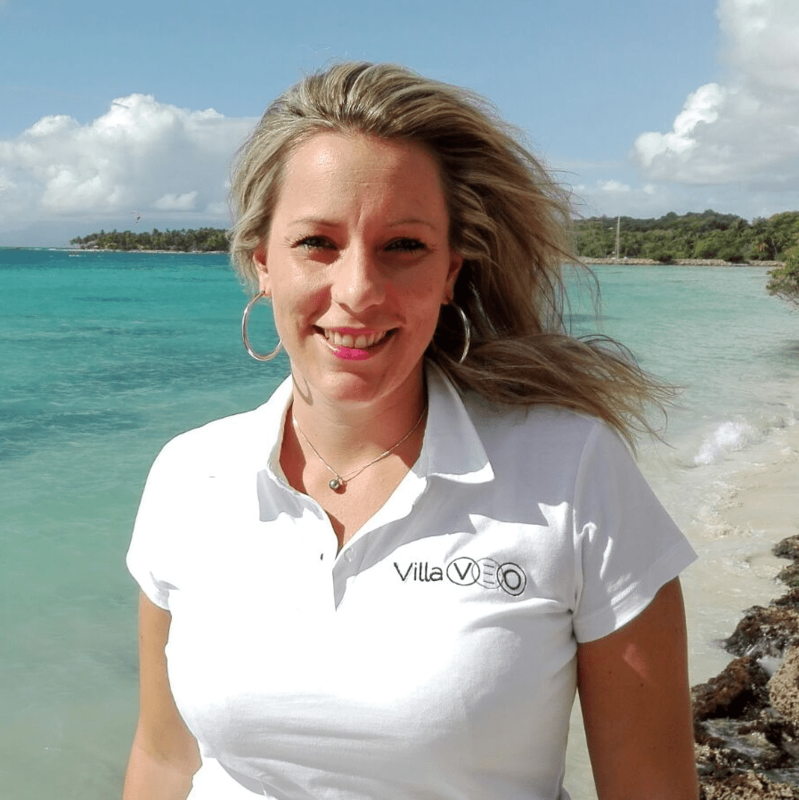 She's always happy to inform you about the many activities in the area: diving at the Réserve Cousteau, hiking in the Parc de Mamelles, bathing in the falls, the botanical garden, the forest aerial adventure park, etc. And to end your holiday on a high note, why not step into another time and discover the island of Marie-Galante? Our villas offer you the possibility to visit for a minimum of three nights. Un grand merci d'avoir pris le temps de déposer ce sympathique commentaire qui je l'espère donnera envie à de prochains voyageurs ! Nous espérons vous recevoir à nouveau en Guadeloupe ! Au plaisir ! La villa était très bien. Le coup de coeur fut la piscine et la vue sur la mer. Nous avons aimé l'espace de la maison et la cuisine était très bien équipé. Nous avons donc bien aimé cuisiner en famille et avons passé beaucoup de temps autour de la grande table entre la piscine et la cuisine. En gros, nous avons vraiment aimé notre voyage en Guadeloupe et nous y retournerons. Le repas avec le traiteur était bien. Cependant, pour le prix payé, nous aurions bien aimé ne pas a avoir a réchauffer certains plats et avoir le service au table que l'on s'attend d'un service de traiteur en Amérique. La discussion avec le chef et la gentillesse des gens avec qui nous avons jasé compensent! Merci pour votre retour sur votre location de vacances en Guadeloupe ! For your next vacation in Guadeloupe, we recommend you to have a look on villas and/or apartments located close to Villa Fleur de Canne. Our selection is based on your search criteria: destination and vacation rental capacity. We are sure that we will find what you are looking for!